Paris St-Germain maintained their 100% start to the season with victory over Montpellier thanks to a second-half goal from midfielder Blaise Matuidi. The France international finished at the near post after he received the ball from Maxwell following good hold-up play by Ezequiel Lavezzi. Ramy Bensebaini had Montpellier's best chance but saw his header saved. Neither £43.4m signing Angel Di Maria nor Zlatan Ibrahimovic featured in the match as they recover from injury. Former Manchester United midfielder Di Maria has a thigh injury while Sweden striker Ibrahimovic is still struggling with a knee problem. PSG, chasing a fourth consecutive league title, have won all three of their Ligue 1 matches so far, scored four goals without conceding. Match ends, Montpellier 0, Paris Saint-Germain 1. Second Half ends, Montpellier 0, Paris Saint-Germain 1. Hand ball by Jean-Kevin Augustin (Paris Saint-Germain). Adrien Rabiot (Paris Saint-Germain) wins a free kick in the attacking half. Foul by Jonas Martin (Montpellier). Attempt missed. Souleymane Camara (Montpellier) right footed shot from the centre of the box is high and wide to the left. Assisted by Daniel Congré with a cross following a corner. Corner, Montpellier. Conceded by Jean-Kevin Augustin. Attempt blocked. Bryan Dabo (Montpellier) left footed shot from outside the box is blocked. Assisted by Djamel Bakar. Foul by David Luiz (Paris Saint-Germain). Souleymane Camara (Montpellier) wins a free kick in the attacking half. Substitution, Paris Saint-Germain. Benjamin Stambouli replaces Lucas Moura. Foul by Serge Aurier (Paris Saint-Germain). Bryan Dabo (Montpellier) wins a free kick in the defensive half. Corner, Paris Saint-Germain. Conceded by Jonathan Ligali. Attempt saved. Jean-Kevin Augustin (Paris Saint-Germain) right footed shot from the right side of the box is saved in the bottom right corner. Assisted by Lucas Moura with a through ball. Attempt missed. Ryad Boudebouz (Montpellier) left footed shot from outside the box is close, but misses to the right. Assisted by Souleymane Camara. Thiago Motta (Paris Saint-Germain) is shown the yellow card. Substitution, Montpellier. Mathieu Deplagne replaces Jérôme Roussillon. Foul by Ryad Boudebouz (Montpellier). Substitution, Paris Saint-Germain. Jean-Kevin Augustin replaces Ezequiel Lavezzi. Substitution, Montpellier. Joris Marveaux replaces Paul Lasne. Substitution, Montpellier. Souleymane Camara replaces Rami Bensebaini. Foul by Adrien Rabiot (Paris Saint-Germain). Ryad Boudebouz (Montpellier) wins a free kick on the left wing. Attempt saved. Djamel Bakar (Montpellier) right footed shot from outside the box is saved in the top right corner. Assisted by Jonas Martin. Offside, Paris Saint-Germain. Serge Aurier tries a through ball, but Edinson Cavani is caught offside. Attempt missed. Serge Aurier (Paris Saint-Germain) right footed shot from the right side of the box is too high. Assisted by Lucas Moura. Goal! Montpellier 0, Paris Saint-Germain 1. 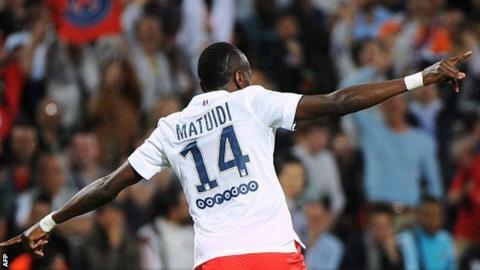 Blaise Matuidi (Paris Saint-Germain) left footed shot from the left side of the box to the bottom left corner. Assisted by Maxwell. Delay in match Thiago Silva (Paris Saint-Germain) because of an injury. Attempt blocked. Edinson Cavani (Paris Saint-Germain) header from the centre of the box is blocked. Assisted by Maxwell with a cross. Offside, Montpellier. Bryan Dabo tries a through ball, but Djamel Bakar is caught offside. Ryad Boudebouz (Montpellier) is shown the yellow card for a bad foul. Blaise Matuidi (Paris Saint-Germain) wins a free kick on the left wing. Offside, Paris Saint-Germain. Blaise Matuidi tries a through ball, but Edinson Cavani is caught offside. Offside, Paris Saint-Germain. Adrien Rabiot tries a through ball, but Edinson Cavani is caught offside. Attempt blocked. Rami Bensebaini (Montpellier) left footed shot from outside the box is blocked. Assisted by Ryad Boudebouz. Attempt saved. Edinson Cavani (Paris Saint-Germain) left footed shot from outside the box is saved in the centre of the goal. Assisted by Thiago Silva.